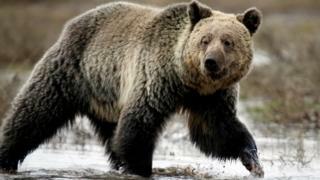 A US judge has ordered protection to be restored to grizzly bears in and around Yellowstone National Park, blocking plans for the first hunts there in nearly 30 years. The Montana judge's ruling overturns the Trump administration's policy. The judge sided with wildlife groups, who say grizzlies are under threat from climate change and loss of habitat. Local ranchers argue the animals are killing their livestock and point to a growing number of attacks on people. Grizzly numbers in the Yellowstone area have increased from 136 in 1975 to more than 700 today - in large part because of wildlife conservation measures, costing millions of dollars. In his ruling on Monday, Judge Dana Christensen stated that the case was "not about the ethics of hunting". This was, the judge continued, about whether the Fish and Wildlife Service considered threats to grizzlies' recovery in the long-term when it stripped the animals of their threatened species status in June 2017. Jude Christensen said that in his view the answer was clearly "no". How did state and federal officials react? Wyoming Governor Matt Mead expressed disappointment. "Grizzly bear recovery should be viewed as a conservation success story," he was quoted as saying by the Associated Press. He added that the Endangered Species Act had a number of flaws, urging Congress to intervene and make changes. Meanwhile, the Fish and Wildlife Service said it was reviewing the ruling and considering what steps to take. Hunters in the states of Wyoming and Idaho had been planning to kill up to 23 grizzlies over the next few months. It would have involved the first such hunts outside Alaska since 1991. Video A licence to kill bear cubs?